You are here: Home / Featured / PREVIOUSLY ON… #44: PS4 Spider-Man: The Heist Review, DC Universe Deletions, & An Ode to the Omnibus! This week I swing back into the new Spider-Man DLC for PS4, question DC Universe’s comic addition strategy, and talk about the absurdity of trying to read an omnibus. Part one of Spider-Man for PS4’s three-part DLC package released on October 24, and more than anything, it’s immensely satisfying to have any reason to go back and play PS4 Spider-Man. Even though it’s been a few weeks since I wrestled with Mister Negative and company, I quickly found myself slowly swinging through the city blasting Wu-Tang and looking for crime, rather than blazing through the new DLC narrative. If you’re looking for something particularly new out of the game, you’ll be disappointed. The story itself is quite familiar, drawing on the Spider-Man and Black Cat mythos that has accumulated over the years in 80’s issues of Peter Parker, The Spectacular Spider-Man and the 90’s Spider-Man animated series. 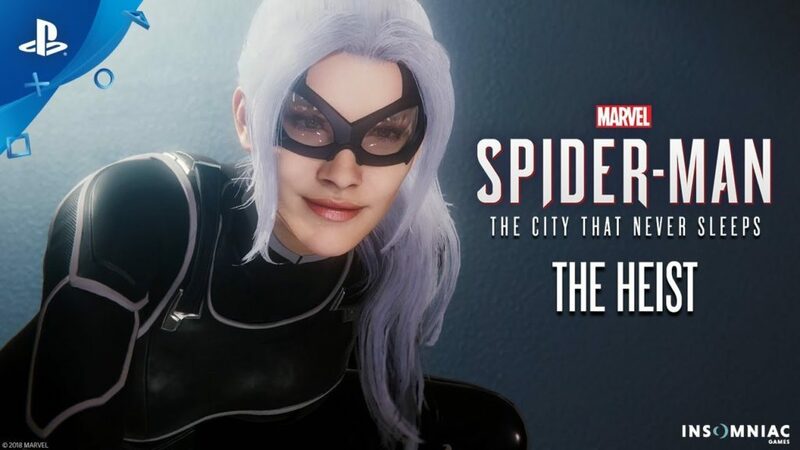 That said, Spider-Man’s attempts to train Black Cat as a sort of sidekick are hardly mainstream, and the DLC also brings in Hammerhead and the Maggia in prominent roles. The best thing about “The Heist” is that it picks up in the aftermath of the main game narrative, meaning it’s an actual in-universe continuation of this world. Again, this is simply a gorgeous Spidey-verse to sink into. For example, J.Jonah Jameson irately calling out The Black Cat as yet another “female reboot” is grade-A Jonah, and “The Heist” also finds time for Pete finding more ways to mess things up with MJ. Personally, I would rather have seen another Taskmaster side mission instead of the return of Screwball (ugh! ), but you can’t win them all. I’m 66% of the way through the DLC in two nights (around 3.5 to 4 hours of gaming), and definitely glad I splurged for the DLC pre-order way back when. If you loved the main event, this is a no-brainer. I have to say, I did not expect DC Universe (DC’s new digital content streaming library) to draw tactical influence from Mission Impossible. Nonetheless, there was the alert on my phone announcing the addition of New Teen Titans issues to the comics library. Issues #28 to #40 were added to DC Universe (now in month 2) for two weeks. Wha? Huh? All in all, it speaks to how differently DC Comics is treating their comics library compared to the existing competition like Marvel Unlimited, Hoopla, or Comixology Unlimited. DC Universe is experimenting with their library in ways I simply haven’t seen. It’s going to rub a lot of fans the wrong way, but honestly, I’d imagine the comics portion of DC Universe remains a semi-afterthought with new TV episodes launching weekly. One of the biggest questions comic readers had about the service was what the promised library additions would look like. In addition to the timed New Teen Titans vanishing act, DC Universe has also added a number of topical series, seemingly one at a time, such as Batman: The Long Halloween as all Hallow’s Eve approaches. Simply put, those looking for any resemblance to Marvel Unlimited (and their weekly additions of new comics and backmatter) are going to be supremely disappointed. Right now, my overall review of the service hasn’t changed much, but the opportunity to make it more of a hearty recommendation with comics additions has been missed. There’s no reading experience more unwieldy than the mega Omnibus comic collection. Often upwards of 1,000 pages of comic book story bound in a single testament to fandom, standard styles of reading fall short of the Omnibus’s burden. You can’t lie in bed with an Omnibus, at least not without crushing your spleen. You can’t sit on a couch with an Omnibus, at least not unless you can shoulder raise 20 lbs of pure narrative for hours on end. You certainly can’t travel with an Omnibus, at least not unless you’ve purchased an additional airline seat, or paid a small child to hold the book upright in the space next to you (not that I’ve, um, tried). No, the Omnibus demands you accept it on its own terms. While digital versions have made many of these concerns moot, you and I both know that this workaround is for cowardly proponents of that time-tested villain known as efficiency. Lately, I’ve found that my Infinite Crisis Omnibus is amenable to lying flat on the dining room table, ensuring one entire place setting is committed to the dastardly deeds of Maxwell Lord. Is it convenient? Of course not. But it is there waiting for me at every meal, and in that sense, who’s to say the Omnibus isn’t part family? I love your ode to the omnibus Dave. When I was carrying my Invincible Compendiums around recently to reread that masterpiece, they certainly felt like family. I am feeling a bit disappointed by the DC Uinverse decision to add both comics and movies only temporarily. Maybe partly because I’m a pretty busy person, I often plan to watch a certain movie on Netflix for quite a while before I actually have the time to watch it. This service now makes me feel a lot of pressure to get through as much content as I can before it’s pulled, and I really don’t want reading comics and enjoying superhero movies to feel like an obligation I have to check off my list each week in order to get my money’s worth. However, I have the service for over a year still, so I’ll give them time to figure out what they’re doing and maybe strategies will change between now and then.